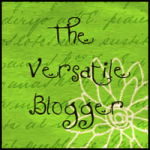 Versatile Blogger Award | I'm not weird, I'm just a limited edition! I have been nominated for the VERSATILE BLOGGER AWARD, by Festival King. Upe has been a loyal commenter on my blog and her support has been great. Sometimes this writing thing gets hard especially when it feels like no one is reading your work… She writes amazing poetry and her short stories provide lots of entertainment. Click here to visit her website. I love all things bright coloured! All I need in my closet are dresses. I have a thing for black and white photos. I scream for my mummy every time I see a spider in the house. I turn 25 in just over a month and I am uber excited. All I want in this life is to travel and see the world. I get really uncomfortable when people comment on my looks. Aww, what a sweetheart you are, and how honored I am to be among your fifteen. 🙂 Thank you. Thanks Sunshyne! And thank you for liking my stories. my very first blogging award thank you so much!!! !